Published by Mountainblog on 12/21/2017 . In its Fall/Winter collection 2018/19 Vaude has completely redesigned many of its models for the Back Bowl Series. 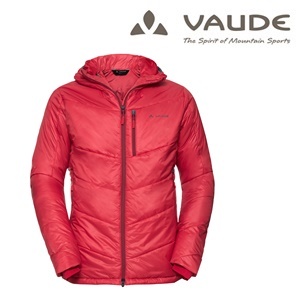 For downhill oriented ski tourers and freeriders, Vaude offers a complete ensemble of waterproof, highly functional 3-layer pieces including a fleece hood, technical fleece midlayer, and an extra-wide wool headband in matching colors. When the temperatures really drop, you can choose our warmly insulated PrimaLoft® jacket (Back Bowl SYN Jacket). For taking in the view at the summit, the afterglow of a ski tour, or just for everyday — a warm, cozy thermal jacket is worth its weight in gold! The casual Back Bowl SYN Jacket is lined with an eco-friendly synthetic down (PrimaLoft® Black Insulation Hi-Loft). This high-loft insulation is significantly more low-maintenance than real down, it maintains warmth even when wet, and dries fast. 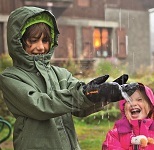 As a warm hooded jacket, it has two practical handwarmer pockets and packs down small so it’ll fit into any backpack. This product is made with Eco Finish, and eco-friendly water repellent finish without the use of fluorocarbons (PFC). The VAUDE Green Shape label stands for environmentally friendly, functional products made from sustainable materials. The VAUDE brand stands for respect in all its interaction with others and with nature. This family-run business based in Tettnang has set its sights on becoming Europe’s most sustainable outdoor brand by the year 2015, so that sportsmen and women of today and those to come can enjoy nature to the fullest. We have been working with the strict environmental bluesign® standard since 2001, which monitors the entire textile manufacturing chain. We were also the first Outdoor company to receive EMAS certification. The VAUDE Green Shape guarantee denotes our products that are especially environmentally friendly and resource-conserving. VAUDE is on the way to gradually transitioning to environmentally-friendly manufacturing for its entire product range. Since 2012, the company headquarters in Tettnang and all products manufactured there have been climate neutral. 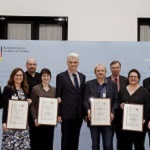 VAUDE Green Shape Core Collection receives iF Design Award in Gold.